a quantity that characterizes the rotational effect of a force acting on a rigid body; the moment of a force is a fundamental concept of mechanics. A distinction is made between the moment of a force about a center (a point) and about an axis. of the force. The dimensions of the moment of a force are L2MT2, and the units of measurement are newton ⋅ meters (n ⋅ m), dyne ⋅ cm (1 N ⋅ m = 107 dyne ⋅ cm), or kilogram-force ⋅ meters. 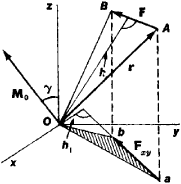 where Fx, Fy, and Fz are the projections of the force F on the axes; x,y, and z are the coordinates of the point A of application of the force. If a system of forces has a resultant, then the moment of the system is calculated according to Varignon’s theorem.